Forget toothbrushing tantrums, this product start-up makes children actively want to brush their teeth. Does it bring a smile to your face for People’s Champion? Getting children to brush their teeth can often be an arduous task; not to mention getting them to brush properly and for long enough. Having noticed the growing trend of children using smartphones with media consumption on the rise, entrepreneurial trio Paul Varga, Tolulope Ogunsina, and Matthäus Ittner came up with an innovative solution to combine mobile gaming with teeth-brushing… the Playbrush. A smart hardware device which uses motion sensors and Bluetooth to connect to iOS and Android games such as ‘Utoothia’, Playbrush helps children with their daily toothbrushing by turning it into a fun and interactive game. The device can be attached to any manual toothbrush to make it into a game controller. While children brush their teeth, they can control mobile games with their brushing movements – consequently helping children to learn how to brush properly. You can have up to six personal profiles on each app – meaning one family only needs one Playbrush – and the app provides post-game statistics and brushing rewards and trophies with the aim of creating a positive atmosphere around dental health. 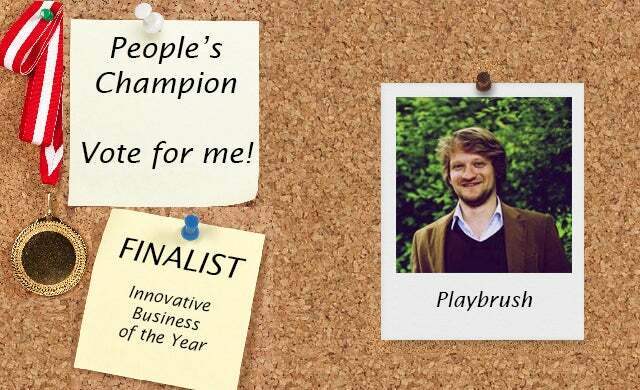 Since launch in November last year, 50,000 Playbrushes have been sold across the UK, Germany and Austria, and the device has won a series of international awards including ‘Best Technological Innovative Award’ at the Gamification World Awards 2015. With a patent pending and expansion on the cards for North America and Asia, the Playbrush team are also looking at other potential revenue streams including working with dentists to use the data it collects from each brush. Playbrush’s innovative device is making major in-roads in changing children’s approach to daily oral hygiene. With children’s smartphone usage having increased dramatically, we love that the Playbrush team are using this trend for good.